If I'm being real, this week actually kinda went by quickly... talk about a nice change, right? But, I'm hoping this trend ends when it comes to the weekend and the minutes go by at glacial pace. 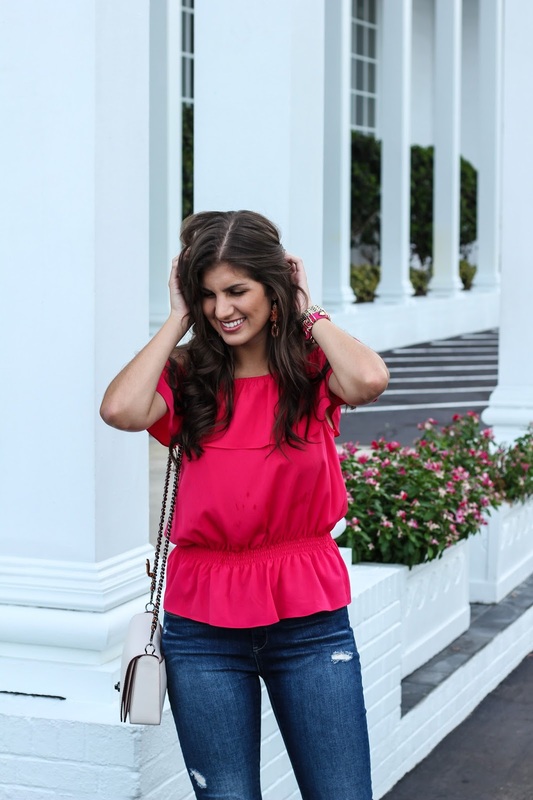 I am finally getting this look here on the blog - the past few times I've tried to post, something has always come up. GRR. 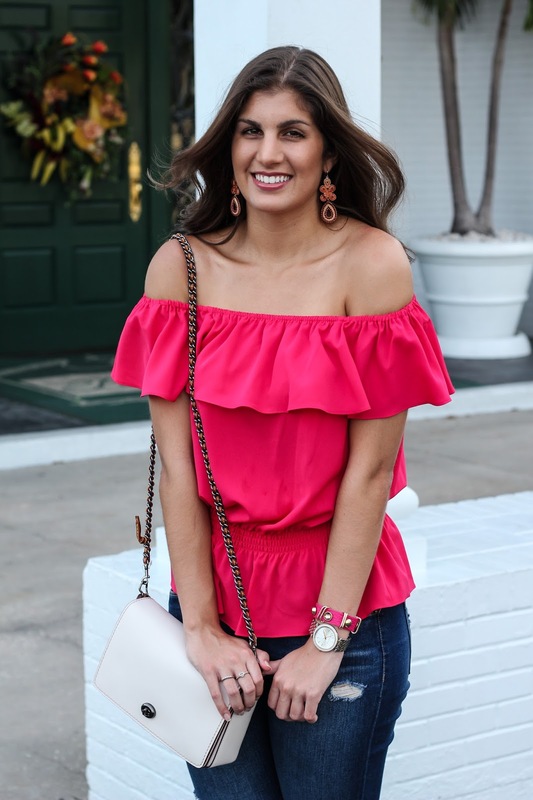 For some reason, I've just been seriously attracted to everything off-the-shoulder this season. I don't even have that great of shoulders to show off, but these fluttery numbers keep finding their way into my closet. 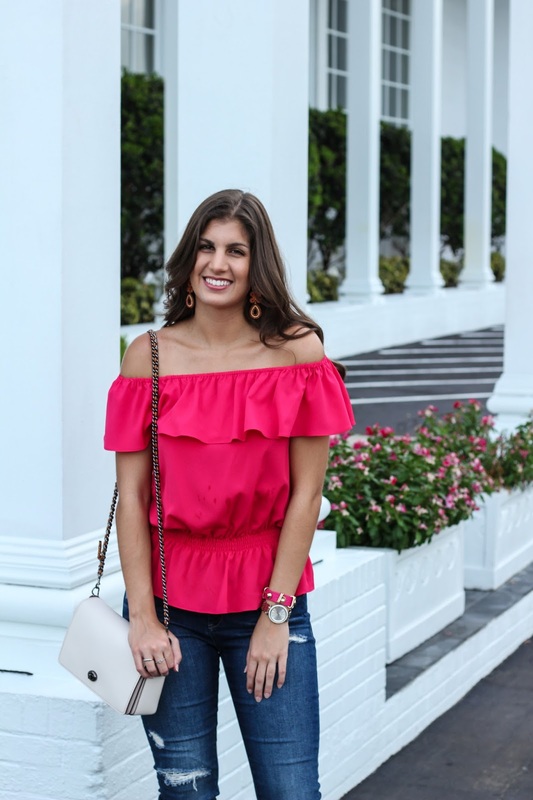 This top especially is one of my favorites! I know... total shocker coming from the girl who pretty never wears anything pink. Total pink item count in my closet: 3. Total black item count in my closet: 87645168654. 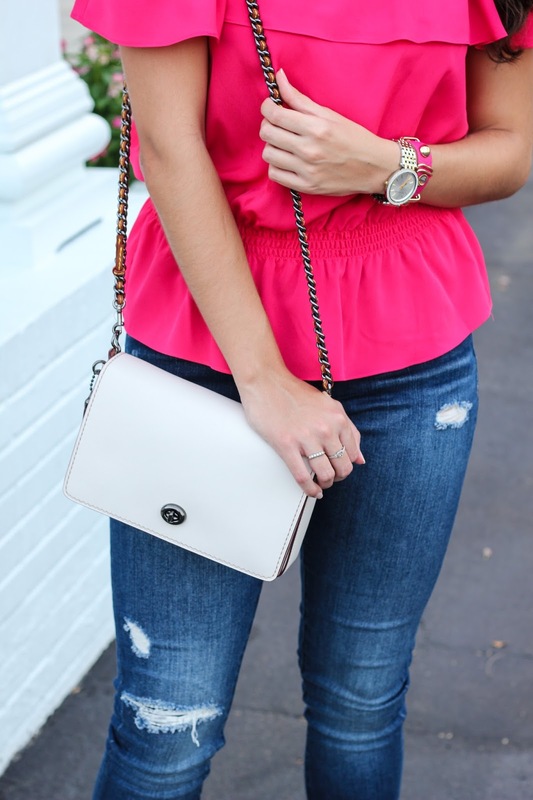 I've also been living in these jeans - they are so perfect for any occasion. I've worn them to work with a tank and blazer and on a date with a halter top. Versatility is key, my friends. 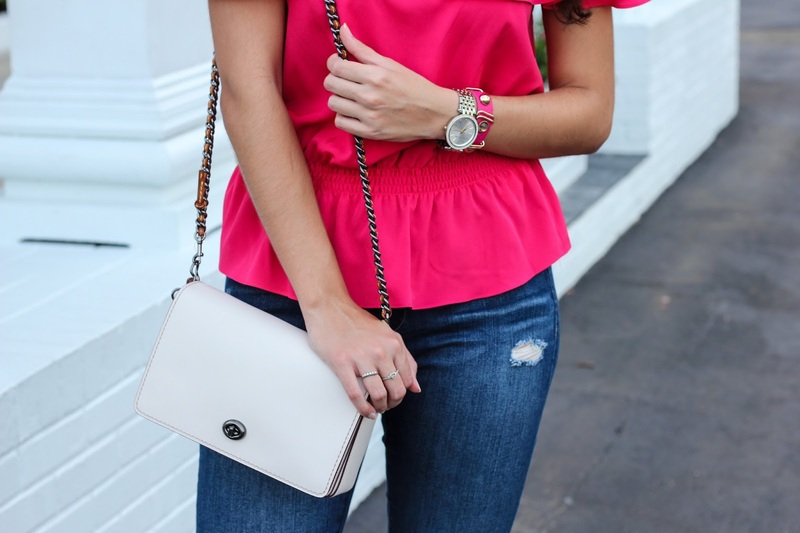 I've linked these and my other denim favorites that are all still on sale right now as part of the Nordstrom Anniversary Sale! And, I've grouped up with my favorite bloggers to give one of you a $1350 giftcard to shop until you drop. Be sure to enter below! Have any fun plans for the weekend? This top is literally the cutest!! Love it! You look gorgeous in this color! So pretty! so i don't usually like tops that have elastic at the waist, but this one is actually really flattering - awesome find! Cute top! I really love your bag too!! This top is absolutely gorgeous. I love the color and it looks amazing on you. Awe, pink is my favorite color. This shade really pops and goes well with your jeans. this top is SO cute!! I LOVE the color! 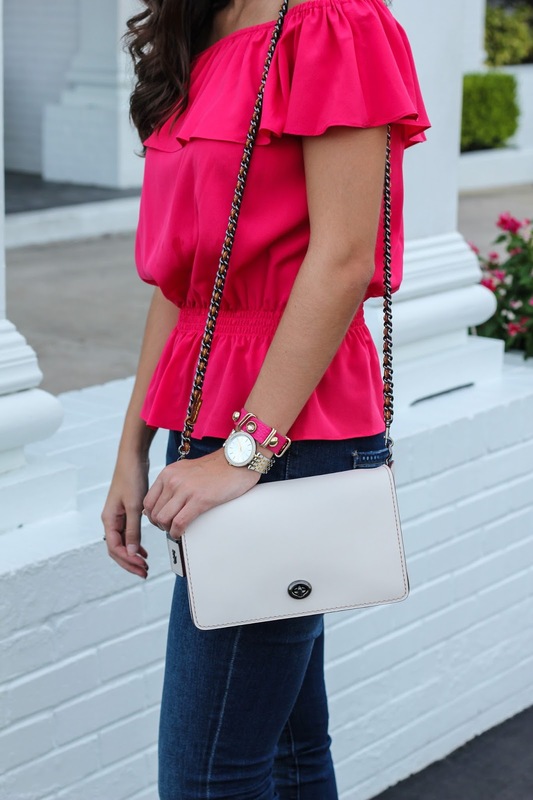 I love the bright pop of pink from this top - FAB! 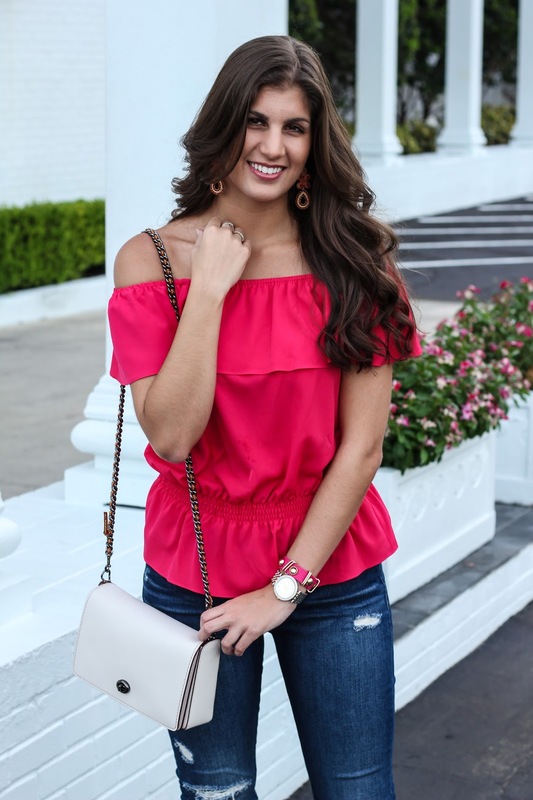 This OTS top is so cute—love the bright color! Perfect summer top. So flirty and gawwwgeous!! I just adore this color on you! Literally just purchased these jeans and waiting for them to come in the mail! I love how you style them.